The US and Saudi Arabia have been conspiring with one another to engineer a series of crises that could prompt Iran to pull back its troops in Syria and redeploy them back to the homeland. The modus operandi has been to encourage peripheral insurgencies inside the Islamic Republic’s borderland regions concurrent with a terrorist threat to the interior, all while stirring up Color Revolution commotion. In short, Washington and Riyadh are working hard to wage a multidimensional Hybrid War on Iran, and all indications point to each respective component of this campaign intensifying in the coming months as the US turns up the heat against its decades-long Mideast rival. The international media – both Western and alternative – has paid a lot of attention to the Kurds in Turkey, Syria, and Iraq, but practically no established outlet or reliable mainstream media network is focusing on the Iranian Kurds. For those readers who understandably aren’t aware of what’s been unfolding over the past month, the Kurdish Democratic Party of Iran (KDPI) has been waging a vicious insurgency against Tehran on the pretense that the government has reneged on a previous ceasefire and political guarantees. The reality, though, is that the militant Kurdish nationalism that’s been sweeping the Mideast over the past couple of years has finally infected Iran, just as the author predicted would inevitably happen in the scenario forecasting portion of his 2015 book about Hybrid War theory. Furthermore, this group of “Secular Wahhabi” Kurds isn’t fighting for independence, but openly wants a regime reboot that transforms the entire Iranian system from an Islamic Republic into an Identity Federation. The reason that this conflict isn’t being talked about a lot is because it’s “politically incorrect” for both the Western and non-Western outlets to report on. For example, unipolar-supporting information networks seem to have an unspoken agreement to not gloat about this occurrence, despite it obviously being to the US and Saudi Arabia’s strategic interests. It’s uncertain exactly why this peculiarity is in force, but it might have something to do with Washington signaling to its proxies that it would prefer to wait until a forthcoming moment to fully publicize everything that’s happening, perhaps wanting a significant victory or alleged “human rights (false flag) violation” to take place first. There’s also the political sensitivity of still abiding by the nominal ‘détente’ between the US and Iran, and not wanting to feed into Tehran’s well-grounded accusations that the Kurdish combatants have international support. All of these considerations are of course only temporary and relevant for as long as the US refrains from permitting its mainstream information allies from going all-out in their coverage of this conflict. From the other side of things, the alternative multipolar-aligned media is hesitant to report anything that presents the Kurds in a negative light, having fallen so deep down the rabbit hole in glorifying them for their anti-Daesh struggle that it seems almost impossible to ‘reverse the script’ and talk about the truth of their treachery (whether in Syria or Iran). The previous narrative of the Kurds being ‘brave freedom fighters’ was an overly simplistic one which failed to take into account documented human rights abuses by this group’s leading militias or the Syrian Kurds’ own hate-filled manifesto against Damascus. Instead of investigating who the anti-Daesh Kurdish militias really were and where their international loyalties lay, alternative media broadcasters opted to jump on the bandwagon of calling them “heroes” and implicitly lending normative acceptance to their autonomy/”federalization”/independence demands, especially in the immediate aftermath of Turkey backstabbing Russia, and thereby inadvertently falling into the US’ trap of building geopolitical legitimacy for the same groups that are now fighting to dismantle Syria and Iran. To qualify the specifics of what’s been happening in northwestern Iran, it’s not indigenous Kurds that are “revolting”, but Iraqi-based Iranian Kurds that are invading the country from their safe haven in the Kurdish Regional Government (KRG). These cross-border attacks have become so bad and raised such a military-strategic alarm back in Tehran that the government even said that they’ll launch their own retaliatory cross-border strikes and engage in hot pursuits if they found it tactically necessary to defeat these terrorists. Iran knows that these militant incursions are supported by KRG President Barzani, which is another one of the many reasons that it has for supporting the opposition Patriotic Union of Kurdistan (PUK) and Change Movement (Gorran) against the Kurdish chieftain’s Kurdish Democratic Party (KDP). Moreover, the oil pipeline that Iran plans to build to Iraq will extend to the KRG PUK-influenced city of Koysinjaq, which will eventually give a long-term boost to that party at the expense of the KDP. The hostile forces behind this anti-Iranian insurgent war are much bigger than Barzani, and Tehran has actually accused its rival Riyadh of being the mastermind behind this war. Both the Saudis and the KRG expectedly denied these claims, but bearing in mind just how intense the regional competition is between Iran and Saudi Arabia right now, it’s completely plausible that the Kingdom would seek to capitalize off of the Kurds’ battle-hardened fighting skills and massive undercurrents of international support as a means of sowing unrest within the Islamic Republic. It would actually be uncharacteristically strange if the Saudis weren’t involved in this plot to some extent or another since they have a long track record of using all means available against their chief international opponent, so employing the Kurds as convenient allies in this larger regional proxy struggle would fully correspond to their previous pattern of strategic behavior. Therefore, despite being vehemently denied by the Saudis and their alleged KRG henchmen, observers have every reason to accept Iran’s claims about Riyadh’s covert military support to the KDPI and thenceforth proceed from this point of reasonable understanding. As could have been expected, the US is playing a very strong “Lead From Behind” role in indirectly funding this insurgency and strengthening its viability. Instead of openly having anything to do with the KDPI and thereby possibly compromising their “independence” and the mythos behind their “organic uprising”, the US chooses instead to syphon money and supplies to the fighters through its KRG proxy. Just the other day Washington clinched an historic deal to provide the KRG with $415 million for ammunition, food, pay, and medical equipment, though it’s highly probable that some of these funds and equipment will be purposely laundered to the KDPI. It’s an open secret among many that the KRG functions as the headquarters of the international Kurdish militant movement, though for reasons of political sensitivity and Great Power politics, this isn’t officially acknowledged by any major players except for self-interested Turkey from time to time. The KRG first functioned as a safe haven for the PKK, though this has been changing in recent years as Barzani increasingly makes it known that he’s Erdogan’s main capo in keeping control over the region. Therefore, while the PKK has found the KRG to be less friendly of a host than it was before, the same can’t necessarily be said about the YPG, which cultivate such strong cross-border contacts with their brethren in northern Iraq that they even called upon them to ‘save the day’ by helping in the defense of Ayn al-Arab (popularly known in the international media by its Kurdish name “Kobani”). As for the KDPI, their headquarters are located in the KRG and they’re known to be close to Barzani, the recipient of the US’ nearly half-a-billion dollar largesse. For this reason, it’s just as predictable that the KRG will funnel some of its aid to its allied Syrian YPG as it would to its allied Iranian KDPI. Additionally, it’s very difficult to get any information about the KDPI’s activities in the KRG over the nearly past two decades that it’s been sheltering there, but an informed supposition would be that they’ve previously received indirect American assistance via this framework before, if not directly through some of the hundreds of on-the-ground military trainers that are active in the region right now. The worst related scenario that could arise with the Kurdish insurgency in Iran is if the KDPI fighters allied with the PKK and began using Turkish territory as a launching pad for their cross-border raids. The two militant groups have previously been at odds with one another, but a mid-2015 meeting was meant to squash their mutual misunderstandings. The only state actors who have an interest in the PDPI attacking Iran from PKK-held territory in Turkey are the US and Saudi Arabia, which would be overjoyed to see observe the deteriorating relations between the two neighbors if Iran reacts by threatening cross-border retaliation and Ankara expectedly vows to defend its sovereignty in response. There’s no guarantee that either of these governments would react in this way, but it would be irresponsible to ignore the grand strategic interests that the US and Saudi Arabia have in working to bring this scenario into fruition. On a related tangent, if it’s revealed that members of the KDPI are sheltering in the northern Syrian territories presently occupied by their YPG allies, then Tehran might predictably put pressure on Damascus to neutralize them as soon as possible. This in turn could move forward the likely scenario of the Syrian Arab Army (SAA) carrying out a disarmament campaign against the YPG, perhaps even advancing it to before the full defeat of Daesh. In that case, it wouldn’t necessarily be to Damascus’ full advantage to initiate its law and order operation in the occupied northern territories until its most pressing domestic foe is vanquished, but conditions such as the ones just described might pop up to give it little choice in choosing the time of engagement. President Assad would obviously have the full and final say over whether and when the SAA takes on the YPG, but Iranian encouragement and possibly even a Russian-promoted secret deal with Turkey in the context of Ankara’s reported re-engagement with Damascus might press it to do so sooner than many people might expect, especially if a significant KDPI (and PKK) connection can be undeniably proven. 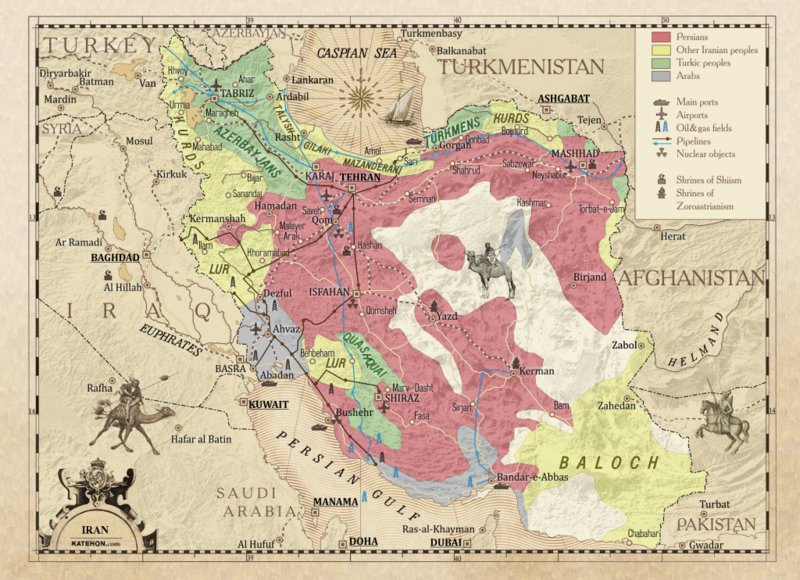 Nowhere near as urgent of a crisis as the Kurdish one, and truthfully not yet even at that dire of a stage, the return of Baloch separatism in Iran could force Tehran into a geopolitical siege mentality and herald in the full splitting of its military-strategic focus. Baloch insurgents haven’t been too particularly active in Iran for some time, but they haven’t been invisible, either. They returned to the fore of Iran’s eastern challenges in the mid-2000s when a spree of terrorism jolted the Sistan and Baluchistan Province, and it’s persistently carried on ever since. Still, the problems that Iran is facing with this potential crisis pale in comparison that of its Pakistani neighbor, which has accused both India and Afghanistan of aiding the insurgency. Both of Islamabad’s neighbors have a geostrategic self-interest in weakening their mutually adjacent neighbor, though it must be said that they’re very likely doing this with some sort of advisory and/or subtle encouragement from the US. Actually, the US seems primed to fuel the anti-Pakistani Baloch insurgency through its contemplation of a separate Baloch-language “Voice of America” (VOA) service. Although words are literally only just that – words – they could play a powerful role in persuading susceptible and misguided Balochi youth to sympathize with the insurgents and then take up arms alongside these very same fighters that the US influenced them to idolize. Thus, even though the US might not be directly involved or even indirectly have any physical influence on the situation, it could still harness its information services to act as a force multiplier for the efforts of its regional Afghan and Indian allies, both of whom are provoking this conflict with the intent of disrupting the $46 billion China-Pakistan Economic Corridor. As the conflict in Pakistan’s Balochistan Province heats up – which it’s sure to do if the US makes the decision to launch a Balochi VOA service – then it’s probable that the insurgency will eventually spill over into Iran’s Sistan and Baluchistan Province as well, whether or not the US’ allies even intend for this to happen. The fact is that asymmetrical wars rarely go according to plan, and that the probability of the nascent US-Afghan-Indian South Asian axis successfully containing their Baloch insurgency inside of Pakistan’s borders is very low. More than likely, Pakistani-based militants will try to link up with their Iranian brethren, who might also end up encouraged by the VOA’s prospective Balochi broadcasts, and thus create a low-intensity international crisis. Ironically, this would actually be the detriment of Kabul and New Delhi’s grand strategy since they plan to use India’s investments in the Iranian Baloch port of Chabahar to spearhead a trans-Iranian north-south corridor between them, and the destabilization of Sistan and Baluchistan Province would be counterintuitive to their goals. The only one of the mentioned actors who would gain some sort of a benefit from this happening is the US, which has an interest in stoking Baloch separatism in eastern Iran so as to geographically split Tehran’s military-strategic focus. It’s not too important to Washington whether this interferes with the Afghan-Indian intermodal corridor through Chabahar (although the sustainable creation of this is also a long-term strategic goal for the US) because at the moment, it appears that the US has placed a much higher priority on destabilizing Iran along both its Western (Kurdish) and Eastern (Balochi) flanks. Earlier this month Iran revealed that terrorists killed four border guards and then fled into Pakistan, proving that the internationalization of the Balochi separatist crisis might have already begun. Just like with the Kurdish one on the other side of the country, the US and its regional allied conspirators are crossing their fingers that this leads to a deterioration of bilateral relations between Iran and its neighbor, which in the Pakistani case would complicate China’s One Belt One Road vision of connectivity between the two, while any prospective Afghani one could be used to justify a prolonged American military presence in the occupied country after the resolution of the Taliban War. Not to be forgotten, the world’s most notorious terrorist group has long had their sights set on Iran, with their foreign backers eager to use the nominally “Sunni” organization to aggravate the sectarian proxy war with the Shiite-majority Islamic Republic. Daesh has yet to strike Iran, but they were accused of plotting one of the country’s largest-ever terrorist attacks late last month that would have seen them bombing around 50 places in and around Tehran. The Islamic Revolutionary Guard Corps (IRGC) thankfully foiled the attack before it could be carried out, but Iran still remains one of the group’s most sought-after targets, especially if one accepts the thesis that American and Saudi intelligence agents still hold partial influence over some of the group’s members. Washington and Riyadh are dedicated to undermining Tehran as much as they can, and a large-scale terrorist bombing campaign in the capital would have a tremendous effect in producing panic and making some segments of society susceptible to hostile suggestions that the government “didn’t’ do enough” to protect them or that the state’s response is “heavy-handed” and “dictatorial” (e.g. if they enforce curfews, deploy the IRGC/troops in the streets in response, and/or raid terrorist safe houses in Sunni-inhabited areas of the country). Prognosticating the most predictable chain of events that could happen in the tragic event that this scenario becomes actualized one day, it’s foreseeable that Iran might launch highly publicized attacks against Daesh in Syria and/or Iraq, which would have near-equal symbolic and substantial value in exacting revenge for what happened. Unfortunately, Iran’s self-defensive actions would instantly be exploited by the US and its Saudi-Qatari allies in triggering an amplified information campaign alleging that Tehran was carrying out a “sectarian attack”. Never mind that it’s highly doubtful that Iran would ever actually do such a thing as militantly foster sectarian hatred, but the social effect of such disinformation would be to aggravate the regional sectarianism that Saudi Arabia has been furiously promoting over the past decade with the intent of producing an indigenous militant reaction inside of Iran itself. Little known among most casual observers is that some of Iran’s borderland minorities are Sunni, and while hitherto unreceptive to the Saudis’ sectarian rhetoric and mostly content with the equality that they enjoy within Iran, a few of them are vulnerable to believing Riyadh’s lie that Tehran is going on a retributive killing spree against Sunnis. The groups that the Saudis would specifically be targeting with this weaponized disinformation are the Kurds, Balochis, and Arabs in Kurdistan, Sistan and Baluchistan, and Khuzstan Provinces, respectively. Most of these aforementioned minority categories are Sunni, and all three of them have a history of anti-government rebellion, with the first two actively engaged in such activities at the moment. The Arabs were previously reached out to by Saddam Hussein during the Iran-Iraq War (the First Gulf War) and it’s common sense that the Saudis and Qataris have been trying to interact with this demographic for years already, but neither were successful in fomenting significant enough unrest that it truly destabilized the Islamic Republic. Interestingly, Iran’s foreign foes have had a much higher degree of success in doing so with the Kurds and now the Balochis, though the strategic risk can’t be ignored that a major Daesh terrorist attack or series thereof within the country (and the consequent weaponized disinformation that it produces) could push members of this group past the tipping point and inspire them to pick up arms alongside their fellow peripheral militants. The US’ most commonly resorted-to method of regime change in recent years, the Color Revolution, is of course also part and parcel of the plan that it and the Saudis have to prompt an Iranian pullback from Syria. Even though the 2009 “Green Revolution” abysmally failed, the lessons learned from this test run were used to perfect the “Arab Spring” theater-wide Color Revolutions that were unleashed two years later, and they were also applied in modifying the future strategies that would once again be used against Iran, too. Right now it’s unclear to what extent the population is susceptible to a “Green Revolution 2.0”, though it’s safe to say that the youth – as always – are the group most likely to be influenced to partake in this operation. Iran has a profoundly large youth bulge with around 60% of its population being under the age of 30, so there are more than ample enough recruits for the US’ plans when it finally decides to launch a rebranded version of them. Another thing to add is that this demographic appears to overwhelmingly tilt towards the “moderates”, which also adds another layer of intrigue that the US will probably seek to utilize in inflaming Iran’s inter-elite split between this group and the “conservatives”. Though some voices have confidently asserted that a Color Revolution could never break out in Iran again, such arrogant statements absolutely dismiss the factual evidence that the US and its allies are actively preparing to repeat this scenario in the future, whether or not it ultimately succeeds. As the most indisputable confirmation that this is the case, one needs to look no further than the streets of Paris last week. The largest-ever “Free Iran” rally was held in the French capital and attracted over 100,000 people. This hostile gathering not only had the tacit support of the French state that allowed it (and whose Ambassador was angrily summoned by Tehran in response), but also the direct encouragement of a Saudi prince who spoke at the event. Perhaps most chillingly, though, was the participation of the “National Council of Resistance of Iran”, an umbrella group of anti-government movements that even includes the People’s Mujahedin of Iran (popularly known by its MEK abbreviation), which was previously on the US State Department’s list of Foreign Terrorist Organization’s until it was ‘delisted’ in 2012. Seen by many as the most dangerous terrorist group to ever operate within Iran, the MEK has links to the US and Saudi Arabia, and it’s very likely that they’ll play some form of vanguard urban terrorist role in setting off a “Green Revolution 2.0” inside Iran whenever its foreign state sponsors decide that the time is ripe to do so. The three interlinked destabilizations enumerated above have the potential to combine in such a way as to generate a serious multidimensional crisis in Iran. At the moment, only the Kurdish Crisis has been visibly activated, though the Baloch Insurgency seems to be gaining ground in recent years. It’s thus most accurate to state that the strategy of externally influenced peripheral destabilization inside of Iran’s borderland provinces is the first step of the three to ‘go live’, and even so, it’s still in its opening stages. Had the Daesh bombings not been proactively dealt with, then the sudden introduction of the second step of sectarian violence could have realistically catalyzed the peripheral conflicts and possibly sped up the implementation of the third step, another Color Revolution or a “Green Revolution 2.0”. Looking back at the events of the past month and seeing evidence that all three steps are vigorously being promoted in one way or another (the Kurdish insurgent invasion, the attempted Daesh bombings, and the largest-ever anti-Tehran Color Revolution rally in Paris), it should be self-evident to all Iranian decision makers and strategists that their country is explicitly being targeted for Hybrid Warfare and that precautionary defensive actions need to be taken as soon as possible. Just as the US expects, this could realistically take the form of part or all of the IRGC’s redeployment from Syria (and possibly also Iraq) back to the Iranian home front where they’d be much more urgently needed in assisting with internal (border and urban) security. Although ill-intentioned rumors (mostly created by Tehran’s adversaries) have abounded for a while now that Iran will pull some of its troops out from Syria, the recent events expounded upon earlier in this article give credence to the idea that Tehran might actually have a fairly legitimate reason for finally doing so in preemptively defending its own security, even if this means that it’s falling into the US-Saudi trap that was created to induce this very decision. Although there is no evidence that Iran has pulled back its forces from Syria, it could very well be contemplating such a move in the face of what its leadership might consider to be the much more urgent threats afflicting the homeland. The most ironic aspect of this plot, though, is that it occurs at the exact same time that the US is considering to officially cooperate with Russia in its anti-terrorist operation in Syria through the tentatively proposed “Joint Implementation Group”, though it can be inferred that this possible twist of fate wasn’t at all countenanced by American strategists when they conspired with the Saudis in devising this grand Iranian trap. Instead, it was the surprise Russian-Turkish détente that completely changed the geopolitical dynamics by influencing Ankara to belatedly declare that al-Nusra is a terrorist group and to publicly make outreaches to Syria (despite repeating its ‘face-saving’ refrain that “Assad must go”). This means that while Iran might draw down some of its on-the-ground forces to protect its homeland, Russia might correspondingly increase its own aerospace ones in the battlespace, though Moscow would still be unable to compensate for the strategic withdrawal of Tehran’s much-needed frontline forces unless it takes the very unlikely decision to deploy its own boots on the ground to augment the Syrian Arab Army. Even without this happening, a recommitted Russian aerospace campaign with the political will of seeing the war out to its logical end could be more than enough to restore the military balance that would be temporarily offset by the partial withdrawal of some of Iran’s highly skilled special forces, though a robust combination of Syrian-Russian-Iranian interservice forces would be necessary to ultimately secure whatever gains are made and assist with the probable post-Daesh liberation campaign against the illegal YPG-occupied areas of northern Syria.